On April 10, 2016 the unthinkable happened……we cancelled our land line telephone service. 209-836-2044 is now disconnected / out of service. Really quick history: Lori and I are both old time Bell Labs employees in Holmdel, NJ. So land lines and telecommunications services are in our blood…. The passing of our beloved, battery operated via the central office, telephone made me think about how telephones, and telephone service, has changed in my lifetime. 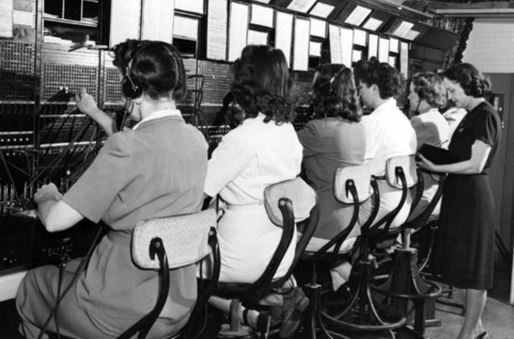 As a boy growing up on Long Island (Bay Shore) I vaguely remember picking up the telephone in our next door neighbor, Patty’s, house (I don’t think we had a telephone line at that time) and asking Ruth (our neighbor Ruth Thorschmidt) the operator to connect us to a certain number. Patty did not have a party line (progress!) so all we had to do was pick up the telephone, ask, then talk. When we were done, we hung up the phone and I suspect Ruth saw that and pulled out the connection. 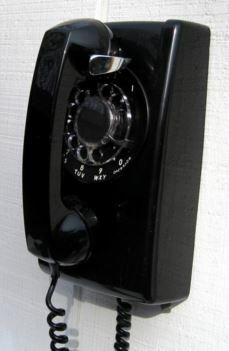 Some time later, my mother installed a black, rotary dial, wall phone similar to the one in the picture. We could now dial the phone number to automatically connect to the person we needed / wanted to talk to. I remember a recurring dream (nightmare) where, in an emergency, I would run to the phone and dial the police. Unfortunately, I always messed up the dial, and then when I got it right, the rotary dial was soooooo sloooooooow. A few years later, we were able to buy a pushbutton phone and my recurring rotary dial dreams stopped (yippeee). 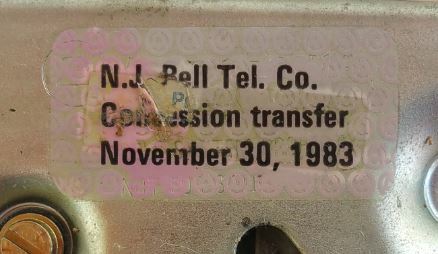 Don’t laugh, but the picture to the left is of our current wall phone, an AT&T Trimline with the following sticker on the back, which means this land line phone has been on our wall since we moved into this house in Tracy, CA on April 5, 1985. Note: We are leaving the wall phone on the wall even though we no longer have dial-tone. Sometime after (or maybe before?) we moved into our Tracy, CA home voice mail came into existence. Oddly for me (duh…TechyMike)…..I ignored answering machines thinking they were a waste. Sooooo it took me awhile before we purchased an answering machine for our home phone. It looked very similar to the picture posted here, and it was wonderful! We no longer had to run into the house to answer the damn phone. The machine did it, and we could check who called later. Progress! And to think, I did not like it…..what a dork. 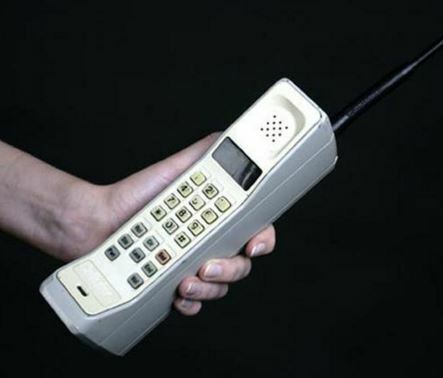 Well, that limitation went away one year after 1985, when Lori and I bought a wireless AT&T home phone that looked something like the one in the picture. Now, you could walk all over the house and talk on the phone. 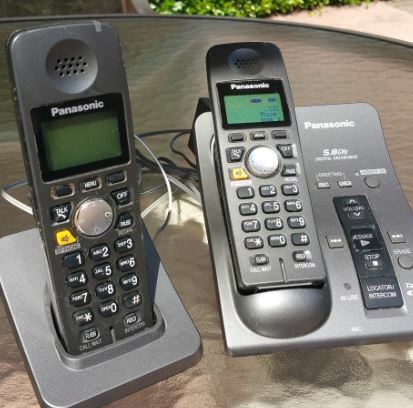 Again, don’t laugh, but our current wireless home phone is the super reliable Panasonic job seen in the picture. It has an answering machine built in which we can access from either of the wireless handsets. 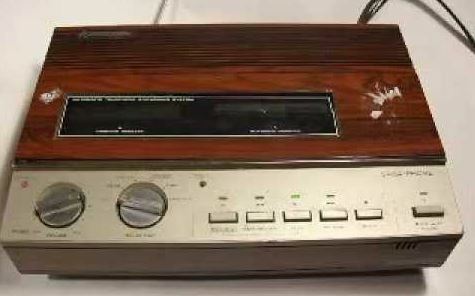 Until recently, the answering machine part resided in the family room for easy access. The other handset was in the kitchen. Within the last year or so, I moved the answering machine into the study as we used it less and less, and had better use for the space in the family room. I got my first cell phone in like 1995 or so. It was clunky and expensive as heck, but, I could use it where ever I was be it Livermore, Washington DC, San Francisco…..or Tracy. Major progress! 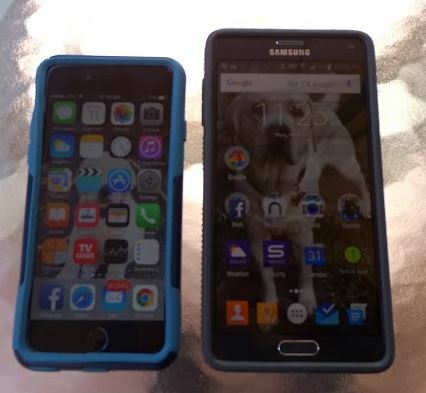 But damn it was expensive, and big…..
As more companies copied the user interface of the iPhone, I finally bit the bullet and purchased an Android smartphone. Long story, but, I “dumped” Apple in the 1990’s after they refused to consider continuing to pursue videoconferencing (we, LLNL, went to Apple HQ to try to convince them not to drop videoconferencing) on their products way back when videoconferencing was new, and Mac-based. Oh wait….they now have Facetime…..arrrggghhhh). Too late….I am an Android /Google, and, ouch, Windows / Microsoft, fanboy now. I had to switch from Apple to stay in, and help advance, desktop / mobile videoconferencing……(now you know why I am so tough on Apple when the need arises…..). As the cell phone / smartphone revolution continued, people started dropping their home land line telephones in favor of cell phones only. Again, oddly for me, I resisted that trend.